Pentek CRFC-BB water filters are ideal for chloramine taste and odor reduction in point of entry (POE) water filter systems and other high flow rate applications. The CRFC-BB radial flow design helps reduce the presence of carbon fines in the filtered water. The bed of granular activated carbon (GAC) between the outer shell and the core is specifically designed to significantly reduce chloramine taste and odor. The unique radial flow design of the Pentek CRFC-BB filter offers the benefits of granular activated carbon (GAC) filtration, such as low pressure drop, while at the same time significantly reducing the release of carbon fines commonly associated with GAC style cartridges. The radial flow design significantly enlarges the pre and post filtration area of the cartridge for greater life versus standard upflow GAC cartridges. The Pentek CRFC-BB water filter is a radial flow chloramine reduction water filter cartridge. 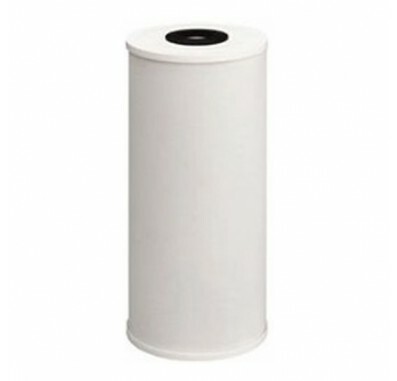 Radial flow carbon filters have a greater life than standard GAC water filter. The Pentek CRFC-BB water filter should be replaced when the flow rate of water through the filter slows or the taste and odor of the original water returns. Then Pentek CRFC-BB should be used in the #10 Big Blue Water Filter Housing.